What the cops used to do in Mississippi voters of color -- now the Republicans want to institute an ID requirement in the same spirit of oppression. It’s a crime today in Mississippi to do what the cops in this photo are doing — preventing a black man from registering to vote. However, the Republican establishment of Mississippi, given their fear of a black activist voting population, want to make it effectively harder to vote in the State of Mississippi. The Republicans are trying to introduce voter ID measures in the state that are unAmerican and anti-human-rights. How can it be that in a country that requires ID to drive and to purchase alcohol that providing ID would be anti-democracy? Imagine for a moment that the white men in this photo holding the black man in submission let go of him. Let’s say they let him register to vote, get to a polling place. Then, looking him square in the eye, filled with the implicit threat of their hatred of his rights, they demand to see his ID before he casts his ballot. 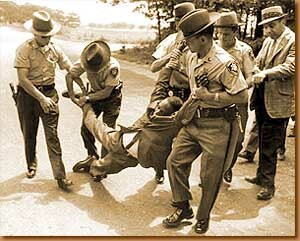 In a small town, one perhaps like the one in Mississippi where the prom is still segregated, voter ID is a deterrent for the people of color of the community the way that these cops holding this man back from registering to vote was a deterrent in the early 1960s. Fair-minded people ought to be outraged at the very suggestion of a voter ID bill by Republicans, who desperately would like the black population of Mississippi to stay home on the first Tuesday of November. The Republicans claim their concern is for voter fraud, but they re not concerned about fraud at all — the only game-changing frauds are in the GOP, given the low, low turnout for most elections. In many of districts in Mississippi, the majority of adult citizens are black. This is a consequence of slavery and generations of share cropping. In some districts, the percentage of people of color is above eighty percent. Yet the majority of eligible persons are not voting. The Democrats bear some responsibility for this — in some cases they have failed to inspire a turnout. However, no one will doubt that the majority of people of color, were they to vote in the State of Mississippi, would not vote for candidates like Haley Barbour, who is the darling of white racists and a former presidential hopeful for the Republicans. They would vote for Democrats. Yes, an election where less than half of the people who might have voted actually vote is fundamentally fraudulent. This by itself is not the fault of any one political party, but an initiative to limit access in even the slightest way to the ballot should shock the sensibility of any American. Ironically, often the Republicans run in Mississippi on the notion that government needs to get out of our lives, that regulations are unAmerican. The gun laws in this state, for instance, are so very lax that I don’t even need to have a permit to own one on my own land. I could own an arsenal without showing ID, one that would make David Koresh look like he was unarmed. That’s the way Republicans want it. However, if they get squeamish at the idea of voting without ID, I wonder who they think they are fooling. Frankly, their work reminds me, particularly given Mississippi’s very libertarian gun laws, of the revolt to racist thinking that inspired Malcom X to write his famous speech “The Ballot or the Bullet.” Is that a choice for any citizens in the 21st century? Have we overcome so little in Mississippi since this photograph was taken about 40 years ago? Republicans just want these cops in this photo to look the black voter in the eye, check ID — intimidate — and keep this man and his family away from the polling places.